Climate change alters meteorological variables that influence the development, chemical transformation, transport, dispersion and deposition of air pollutants. Two pollutants particularly influenced by climate change are ground level ozone and particulate matter. 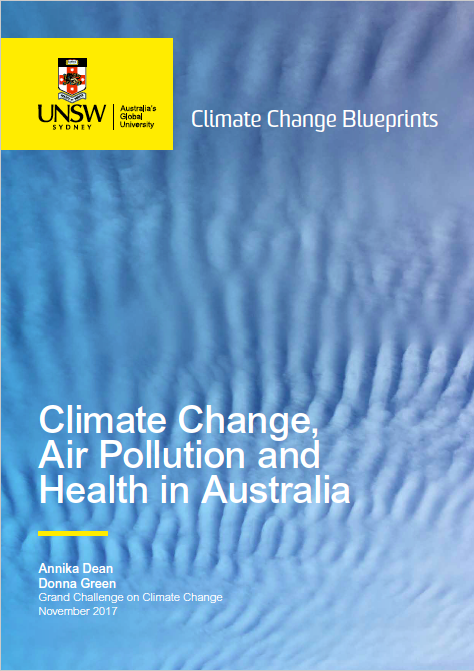 Climate change will also affect air quality by increasing the frequency and severity of bushfires and dust storms, and modifying aeroallergens. Schmidt W, C Sarran, N Ronan, G Barrett, D Whinney, L Fleming, N Osborne et al (2017) The Weather and Ménière’s Disease: A Longitudinal Analysis in the UK . Otol Neurotol. doi:10.1097/MAO.0000000000001270. RN McInnes, D Hemming, P Burgess, D Lyndsay, NJ Osborne et al. (2017) Mapping allergenic pollen vegetation in UK to study environmental exposure and human health. Science of the Total Environment 599. Luke Knibbs, Craig Coorey, Matthew Bechle, Julian Marshall, Michael Hewson, Bin Jalaludin, Geoff Morgan, Adrian Barnett. Long-term nitrogen dioxide exposure assessment using back-extrapolation of satellite-based land-use regression models for Australia. Environmental Research 2018;164:16-25. Gayan Bowatte, Rachel Tham, Jennifer L. Perret, Michael S. Bloom, Guanghui Dong, Nilakshi Waidyatillake, Dinh Bui, Geoffrey G. Morgan, Bin Jalaludin, Caroline J. Lodge, Shyamali C. Dharmage. Air pollution and otitis media in children: a systematic review of literature. International Journal of Environmental Research and Public Health 2018;15(2):257. Dean A, Green A (2017) Climate Change, Air Pollution and Human Health. Climate Change BluePrint UNSW (see below).